The impressive 28.60m Oceane II is a truly attractive yacht for Eastern Mediterranean charters combining classic luxury with new technology. She has an elegant European-style salon and formal dining area, both beautifully fitted and furnished in teak and her luxurious interior is complemented by spacious outdoor areas ideal for sunbathing and entertaining. The yacht is in immaculate condition as she was refitted in 2017, featuring new bathrooms and a wonderful interior salon. The Master cabin is located on the main deck and includes a double bed and an optional sofa bed that can accommodate a child. One VIP cabin with double bed, one sofa bed and two guest twin cabins with two pullman beds are located on the lower deck. Oceane II has plenty of exterior living areas to enjoy in style; an upper fly bridge is perfect for entertaining and relaxing, offering an ideal alfresco dining option and double sun pad. On the fore deck, a comfortable seating area and bow seat are great for a quiet moment. Various water toys are available to keep everyone entertained, all easily accessed from the starboard side steps and swim platform. 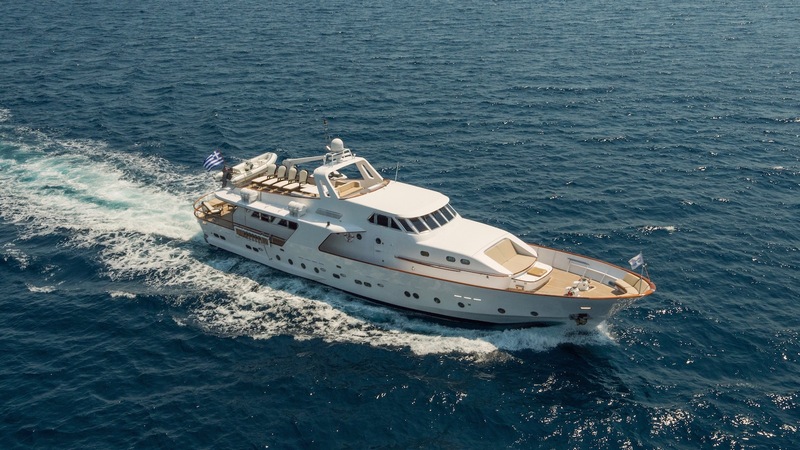 Oceane II’s classic and serene ambiance makes her ideal for a memorable cruising experience.